Jugular venipuncture with palpable veins. Easily replaceable latex vein tubing that can endure multiple punctures; includes 5 sets of veins. Mechanical system allows the veins to be pressurized. Long lasting, easily removable, washable, replaceable hide covering with mane. IM site that can endure multiple punctures and accept fluid injections. Flexible head with well-rendered anatomy illustrates fascial injection sites and accepts a bride. Rolling Stand, adjustable for height, rostral tilt, and 90-degree rotation. 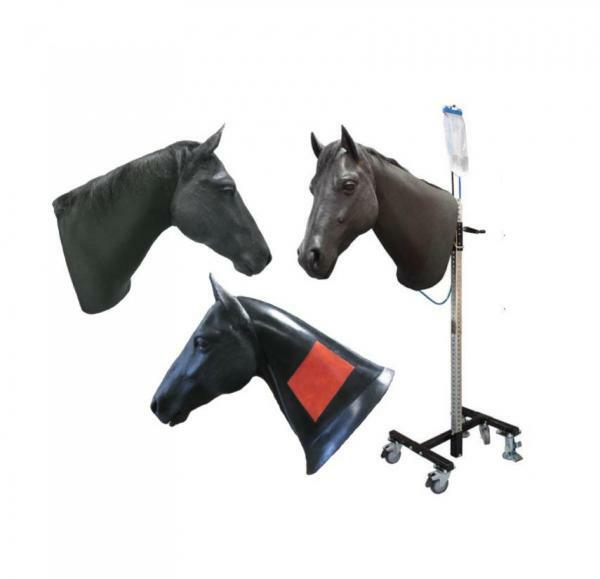 An integrated model combining the Equine Neck Venipuncture and Equine Palpation/Colic simulator is also available.